Even with frequently played characters in the late levels, I’d never had access to more than 100 million influence at a time. Seeing all the high-level build suggestions on the forums relying on literally billions of influence worth of enhancements introduced a disconnect. How did all of these people think money was so easy to come by? All of my friends had long been impressed by a lucky drop that could sell for 10 million. 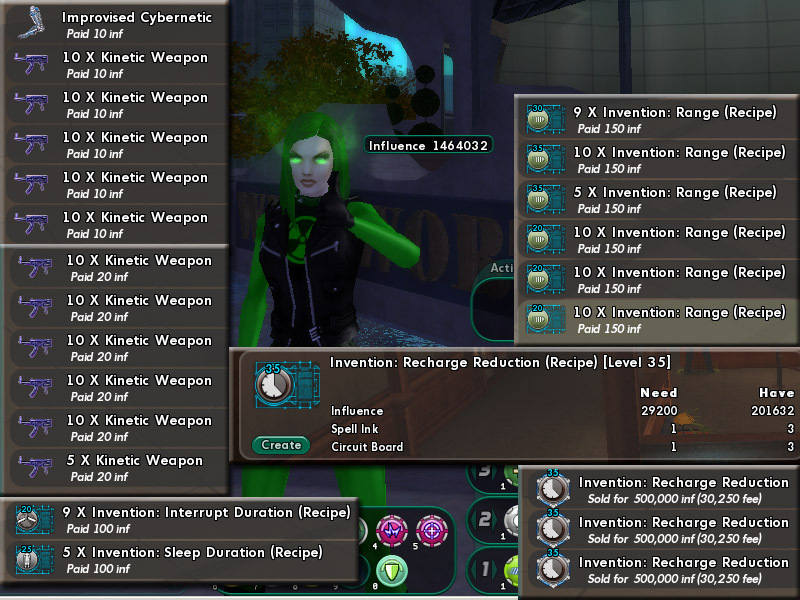 How were we ever going to possibly have enough game currency to make use of the inventions system the way everyone expected (i.e., by buying lots of rare sets to stack awesome bonuses until one’s character defies game balance entirely). I like to think these charts bear out what I’ve said in the previous two installments: there’s fabulous amounts of money to be had, but your number of auction slots become the driving force of value very quickly. Items that make a 200-300% profit net at most 3 million per sale. Meanwhile, items that turn less that 100% profit turn over around 10 million each sale. In general, high-profit items that turn over quickly are an easy way for anyone to make money, especially if you can check in multiple times a day, but the higher-value items will bring in more money to the patient (and those not able to check a lot). Ultimately, it’s very easy to make money on the City of Heroes market. All it takes is identifying an enhancement that sells frequently (all Last 5 transactions from today) and for more than how much you’ll pay to get the recipe and components (and don’t forget the 10% market fee). With the number of players with high level characters flooding the market, and the ease at which the CoH market allows you to set up buy orders that gradually rake in components at reasonable prices, there’s really no reason not to avail oneself of the opportunity to have enough cash to buy all the cool things in game that make your character more competent. In case you forgot from last week, Jenny Gamma, my alt that found herself dedicated to playing the market for fun and profit, ended the first week with over 100 million influence. This is nothing to sneeze at, but it’s still only 1/20 of the influence cap and barely enough to buy a single really good enhancement. I have a lot of alts in the later levels that would really benefit from some nice enhancement sets, so I’m going to need to bring in the big money. It’s still Sunday on free reactivation weekend, and I’m determined to make some good money before another slow spate of weekdays. Maybe I didn’t learn my lesson, because I start it off with buying another Luck of the Gambler: Defense. By the end of the day I’m down again, waiting on some expensive enhancements to sell. Monday through Thursday crawls by before I once again have as much liquid influence as I had on the first day of the week. I flip more orange salvage to while away the time and have something turning over each day. Finally, the Numina’s Convalescence that I speculated on on Tuesday turns over, and I have just over 200 million liquid to take into the weekend. It’s Friday and a lot of the slow-moving, high-value anchors around my auction slots finally find homes with loving (and wealthy) parents. I’m up to 271 million by the end of the night! It’s another beautiful Saturday, although this time without the joy of tons of reactivated players scrambling to consume, and I end the day with over 300 million. Sunday is another great day. By the middle of the day, I pass 500 million as my Luck of the Gambler: Defense recipes finally clear out. They’re good profit, but they’ve been very slow to turn over, and I begin to really internalize the advice of the market forum about fast turnover on slots being more important than huge margins. Another middle of the week. I’ve suddenly got so much liquid influence that it’s hard to invest it all if I’m only pursuing low-value stuff. I go whole-hog and begin to invest in the Luck of the Gambler: Global Recharge bonus enhancement that is every high-level character’s favorite accessory (it goes well with any build!). I also make a lot of Efficacy Adaptors to round out my slots. 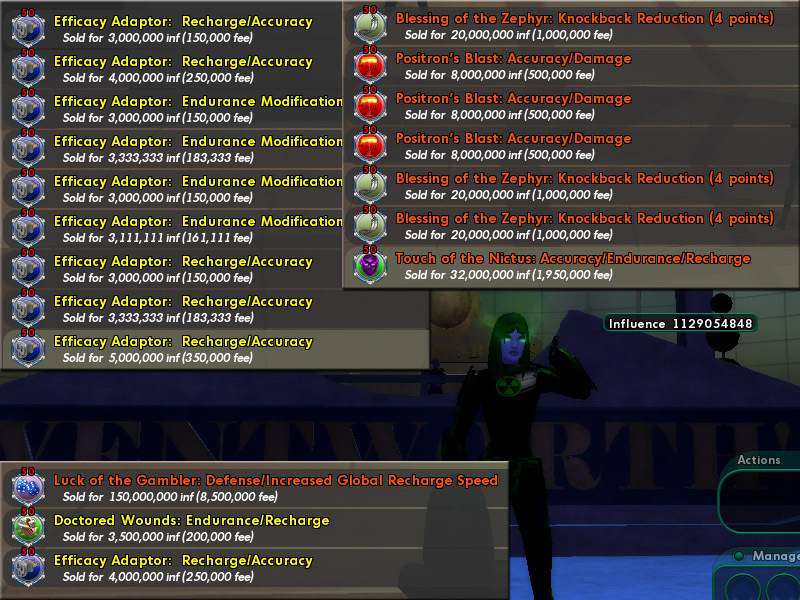 When the Luck enhancements sell, it’s very impressive: they go for 130 million each! However, I paid 100 million for the recipes, and the 10% market commission eats an awful lot at those high values. Ultimately, I probably make way more profit on the parade of yellow enhancements than I do on the big ticket ones. Ultimately, getting a Luck of the Gambler recipe from normal play is a fabulous windfall, but it’s not really worth it when speculating. Thursday and Friday are all about the guaranteed, safe, yellow enhancement sales. I end with 637 million to roll into Saturday. With the greater capacity to sell and buy on the weekend, I decide to experiment with a variety of items, buying large swaths of recipes with theoretically good margins. I’m getting the hang of this, and I end the day with 672 million liquid and a bunch of recipes on hand to pad out the rest of the week. I’m beginning to focus more on big stacks of the same item. It’s faster for me to buy in bulk, and I have enough money to sink into waiting for conservative offers for recipes and salvage to fill. Consequently, I stop bothering to take so many screenshots at this point, because it’s mostly huge lists of exactly the same thing. This week’s big sellers are more Efficacy Adaptors, Performance Shifter: Chance for Endurance, and Gaussian’s Synchronized Fire Control: To-Hit Buff and To-Hit/End (complements to another decent and in-demand proc). By the end of the week, I’ve crossed the 1 billion threshold. Technically, this qualifies for “Ebil Marketeer” status on the forums, but I’m not done yet. At this point, if I had it to do all over again, I could do it faster. Having the ready cash to just buy big stacks that are slow to fill but quick to sell becomes a huge benefit. At this level, there’s almost no way for me to invest all my liquid cash save on the 100 million+ enhancements. I’m tempted to try, but market volatility when I check shows that the margin on them is razor thin this week. I opt to invest in a lot more reliable and frequent sellers. The heroes this week are more Performance Shifter: Chance for Endurance and Blessing of the Zephyr: Knockback Reduction. I fill in with all enhancements in the Celerity set (a running set that can turn Super Speed into full invisibility with its +Stealth enhancement). Next week, a detailed breakdown of what I did, then back to your regularly scheduled programming. I would use one character (no help from alts); very quickly, limitation on personal storage slots on the auction house and in inventory becomes a limiting factor on this, so I didn’t want to “cheat” by having other characters help with their own slots. 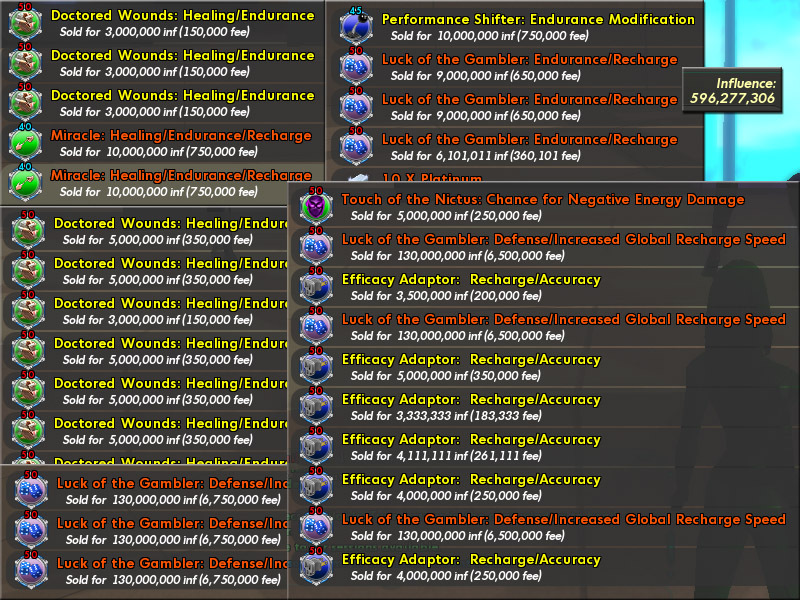 I would start with almost nothing; I began with roughly 500 influence (via selling a low level enhancement) vs. a currency cap of 2 billion, and, given the ease at which common salvage can be bought for next to nothing and vendored for 250, I could have started with literally 1 influence and it wouldn’t have slowed me noticeably. I would not actually play the character during the time; all currency would come directly from playing the market, rather than by getting and selling drops from game opponents. I wouldn’t spend a ton of time working on this; on weekdays, I planned to check in after work and before bed, with more times checking in on the weekends. Since most of the time spent is just waiting for listed items to turn into sales, it’s not really necessary to micromanage your auctions unless you’ve identified a product that’s turning over very rapidly. Enter Jenny Gamma, one of my alts. She’s a Force Field/Radiation Defender, which means she’s somewhat painful to solo even if I wanted to try to farm influence. But she does have most of the crafting badges, which gave her above-normal storage capacity for her level, the ability to make generic enhancements cheaply (which made a small difference early on, but not much towards the real money), and can summon a portable invention station (which I wound up using not at all, because it’s perfectly easy to jump over to the regular crafting stations). Let’s say she had a rough weekend in Atlantic City and came home broke. Day 1 is the biggest example of how quick even a low level character can work the market to get money quickly. The game tends to give out lots of “junk” salvage and recipes in the course of play: because of the variety of powers in the game, there are a lot of enhancement types that are in low demand. For example, pretty much anyone has at least one power that can make use of improved defense, but almost no one has use for improved intangibility (it’s like a hold, only you can’t hurt the target and have to wait a fixed time for it to wear off; almost no one takes intangibility powers). However, the less-in-demand items still sell to NPC vendors at a standard rate. However, either because they want the badges for selling lots of stuff at auction, or they just don’t want to bother finding a vendor, a lot of people will throw low-demand stuff on the consignment house for far less than it will sell for at a vendor. So you can make a killing buying items off the auction house just to turn around and sell them to NPCs. I buy over a hundred Kinetic Weapons for 10-20 influence each and sells them for 250 influence each. After this, I have enough money to start speculating on recipes. Generic Ranged recipes turn out to be listed cheap, and I wind up getting over 50 for 150 influence each and turn around and vendor them for a average of about 5,000 each. At this point, my time invested is mostly in how long it takes to jump over to the vendor from the market. Jenny has 351,638 influence. That’s enough to begin part 2 of the plan. Due to her crafting badges, Jenny has “memorized” a lot of generic enhancement recipes, so doesn’t have to pay to buy them from the crafting station. The crafting itself is half cost. So she can craft, for example, level 35 Recharge generics for about 30,000 influence each. These enhancements also require Spell Ink and Circuit Board components, which are, at the time, going for 40,000 and 10,000 each. So, for roughly 80,000 influence, I can make level 35 Recharge generics. They sell for 300,000-500,000. So, after three of them, Jenny is a millionaire. It’s taken a couple of hours on a Sunday afternoon. I spend the rest of the day stocking up on further Spell Inks and Circuit Boards, and crafting enough to fill my auction slots with Recharge generics, and I’m done for the day. When I log back in, all of the recharge enhancements have sold, and Jenny has 6,608,414 influence. I craft some more of them, and also begin speculating on yellow set enhancements. Set enhancements are where the real money in the market comes from: some of the better commonly available sets provide very significant bonuses, and each enhancement in the set will sell, crafted, for at least 10 million influence. Some enhancements are so good that each one of them sells for over 100 million influence (and this is before getting into the ultra-rare level 50-only purple enhancements or PvP-drop enhancements, that sell for even more). 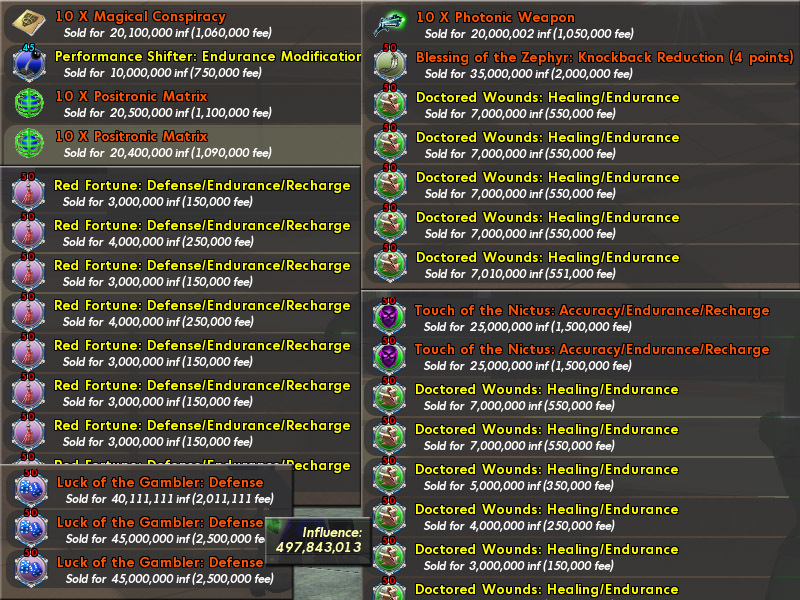 Interestingly, there’s a lot of difference between the price of a recipe and the price of the crafted enhancement. Even though there’s no barrier to crafting in this game, many people will sell off recipes on the market rather than assembling the components and selling the finished enhancement. Meanwhile, even with all these recipes on the market, many players seem to be impatient enough to just buy finished enhancements; even a 50% or more savings is not enough to make it worth it to them to buy a recipe and make the enhancement themselves. 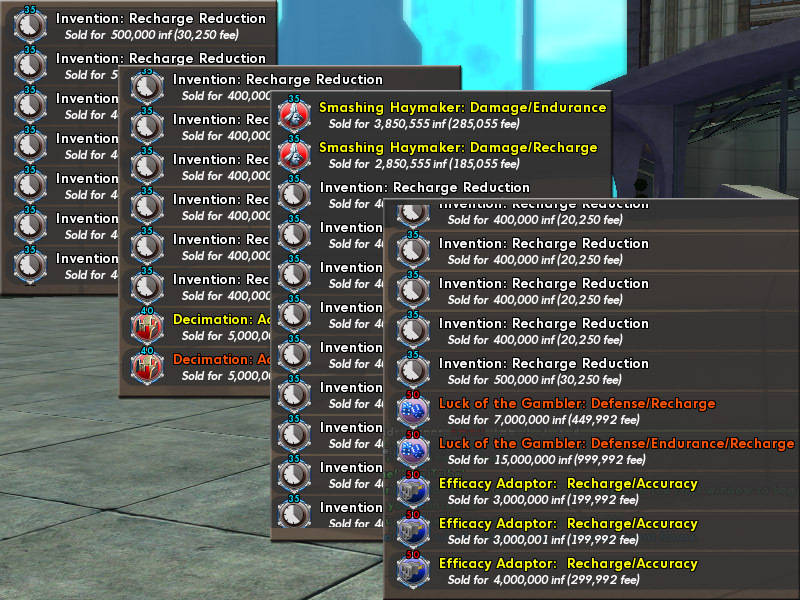 So there’s tremendous money to be made from buying recipes and salvage and crafting them into enhancements for sale. At this point, I’m mostly looking at yellow (uncommon) recipes. While the orange (rare) recipes tend to have better sale prices (few yellow enhancements sell for more than 10 million), they also tend to require rare salvage for at least one of their components. Nearly every rare component in the game auctions for 1-2 million influence, so it’s a bit early for Jenny to start speculating on those. Yellows, though, tend to use much more cheaply available salvage. I get a couple from a melee damage set (Smashing Haymaker) and craft both for under 300,000 including all costs. By the end of the evening they’ve both sold for over 3 million each. With the sale of these plus the generics, Jenny has 16,991,103 influence. I grab a couple more yellow recipes (Decimation, a ranged damage set) that seem to sell for a decent bit, craft them and put them up with some more recharges, and go to bed. I return to everything having sold, and Jenny’s up to 22,181,440 influence. Today brings full on experimentation with yellow recipes, and I’m moving away from generics. They have a consistent 400% profit margin, but my 18-auction-at-a-time limit is already becoming a problem. Essentially, limiting to generics means I will turn over around 5 million influence a day unless I constantly log in to turn over sales. It’s good money, but it would take over a year to reach the influence cap at 2 billion that way. 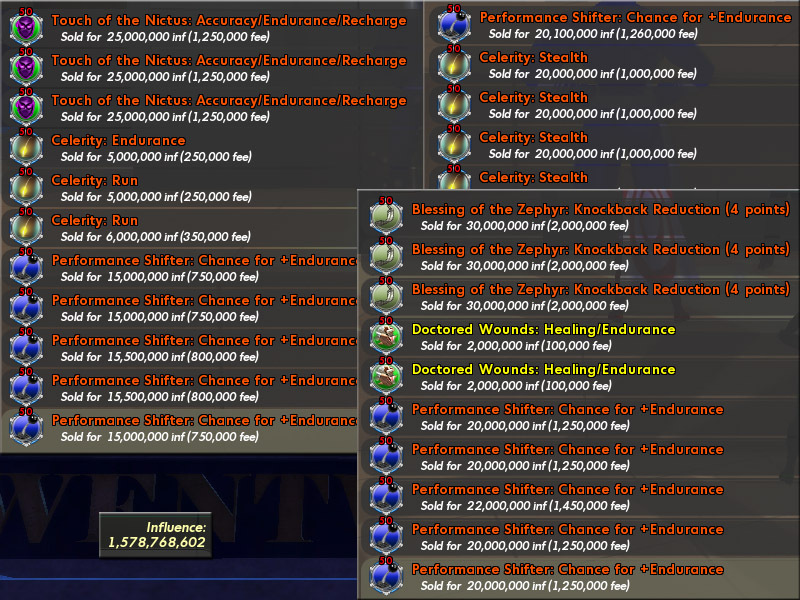 I put nearly all of Jenny’s ready cash into a variety of Luck of the Gambler (defense) recipes and Numina’s Convalescence (healing) recipes; these are from the same set as a couple of the enhancements that sell for over 100 million each, and my hope is that someone dropping 100 million will not worry about more dropped on the rest of the set. Nonetheless, I’m probably dipping into orange recipes a little sooner than make sense. 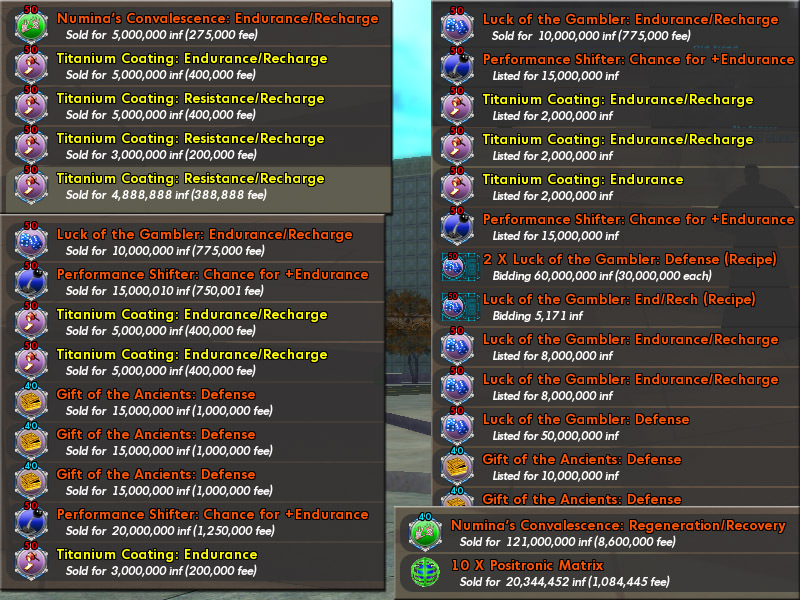 I also grab some yellow Efficacy Adaptors (endurance). All of it gets crafted and posted. The profit margin wasn’t as good as I hoped, and all of the previous day’s work only increase Jenny’s liquid funds by 50% to 36 million. My rate of increase is slowing down as I begin to make huge amounts of influence; but it’s still better than selling generics. Another mistake I make today is continuing to speculate too early on orange recipes. I hope for a big payday and invest most of my money in a more expensive Luck of the Gambler enhancement. It won’t sell for several days. I begin to learn that big money sales are for the weekend, when lots of people are playing; it’s a better idea to stick to cheap and reliable sales to the weekday crowd. It’s another very slow day. Jenny’s now poorer than she was on day 2. I start trying to flip orange salvage. Flipping is the process of putting in lowball bids for items with the intention of immediately listing them for enough to make a profit. The CoH forums tend to explode about flipping in a way they don’t for buying and crafting cheap recipes, as there’s the intuition that people flipping are adding nothing to the game, merely making money by making things more expensive for everyone. The counter argument is that flippers stabilize the market and maintain supply of necessary components: since flippers are buying things people are listing 1-2 per auction slot and re-listing them 10 to a slot, there’s more space for stuff on the market. Additionally, anyone is guaranteed a quick (if small) return on listing components that they might otherwise vendor as worthless. 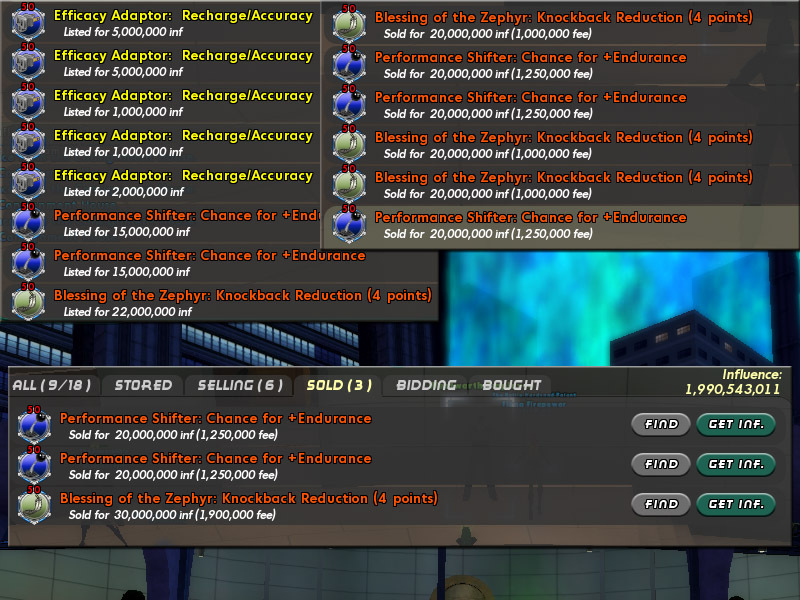 Nonetheless, I feel a little dirty as I begin buying orange salvage at around 1 million to sell at 2 million. I’ll have to assuage my feelings with the sweet, sweet profit. Hey, it’s Friday, it’s free reactivation weekend, and things are picking up. My flipped salvage has come through nicely, and I’ve sold a couple of yellow recipes. I begin to realize that yellow recipes are the safe bet. I buy a bunch of them and post them. Saturday is pretty much the busiest day of the week. My stuff sells, I pick up some more items to flip for cheap, and the lead weight around my neck that was the expensive Luck of the Gambler I made earlier in the week finally goes. By the middle of the day Jenny has nearly 56 million. Feeling a bit saucy, and more confident of a sale on the weekend, I jump back into orange recipes, picking up a Numina’s Convalescence: Heal, a Performance Shifter: Endurance Mod/Recharge, a Performance Shifter: Chance for extra endurance (a big favorite to slot into Stamina, which everyone has), and a Blessing of the Zephyr: Knockback Reduction (an enhancement that goes into any travel power and makes your character resistant to being knocked back by attacks; another big favorite). All these sell overnight, and I’m happily sitting at over 100 million influence. 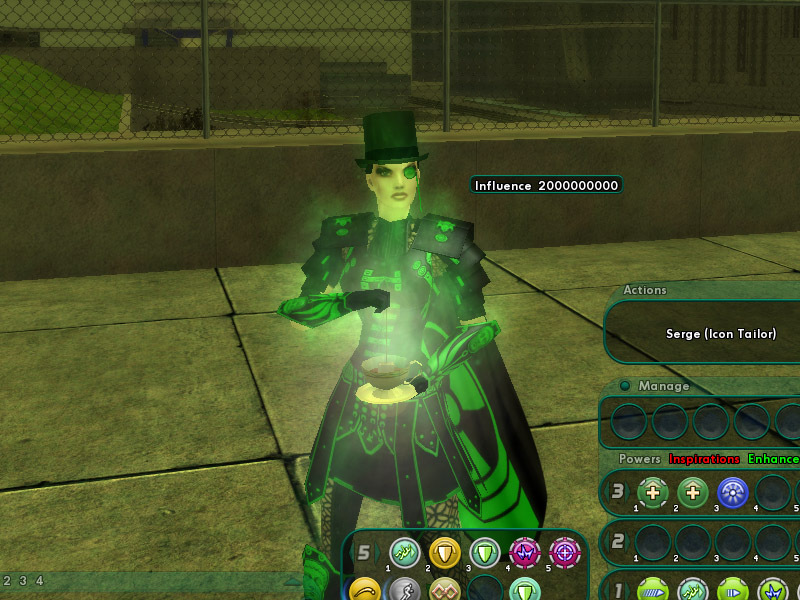 I recently started playing City of Heroes again to check out Going Rogue. One of the first things I noticed on coming back was that various changes to how money is earned, the merging of the markets between heroes and villains, and the growing number of max level characters with nothing better to do than farm currency meant that my assumptions about how much it should cost to “gear up” a character were out of date. I started reading some market strategy guides out of self defense, and found them very interesting… primarily in that my assumption about how the player to player market worked was fundamentally incorrect. But first, keep in mind that the dominant player market system in MMOs is World of Warcraft, which has an auction system. Unless it’s changed a lot from when I played a few years ago, it works a lot like eBay. A player lists an item along with the minimum he or she will accept for it, whether he or she is willing to let it go for a “buy it now” price, and how long the listing will be available. Players see the current winning amount, and know that, if they want the item, they will have to beat this amount and hope no one else comes along offering more money before the listing expires. Impatient players can spend the “buy it now” price and get the item immediately, but for potentially far more than it could be had if they were willing to wait for the auction to expire. Players have to rely on 3rd party sites or their own research to track what the current average sale price for the item is, or, if it’s a common item, they can simply bid on the one that’s cheapest at the moment. Most MMOs that I’m familiar with use a similar auction system, though often less polished or complete than WoW’s. 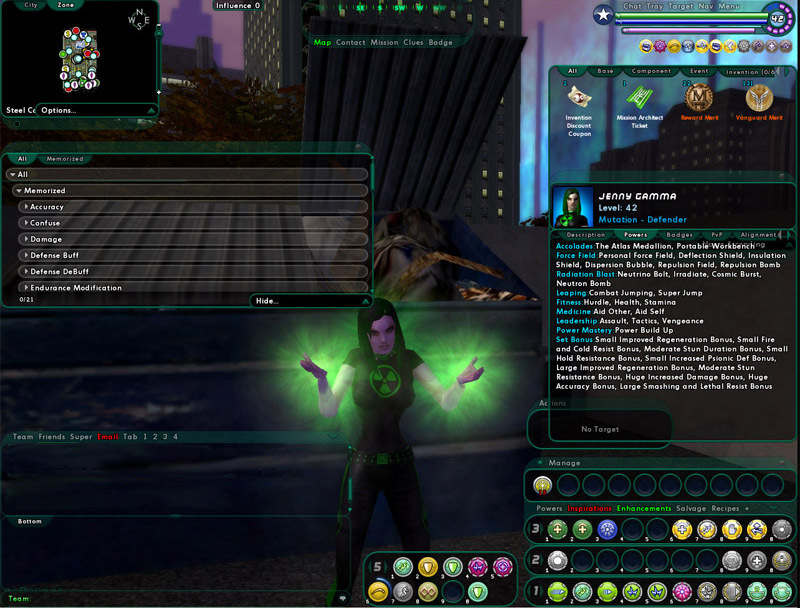 City of Heroes is different, in that it uses a consignment system. Players that want to sell an item simply list it and the minimum price they are willing to accept for it. Players that want to buy an item select it from a list of all available items and enter how much they’re willing to pay for it. For slow-moving items, there may be only one person buying or selling at any given time. If you’ve listed an item, as soon as a buyer requests it at a price equal or greater than your asking price, it’s sold and you receive the amount spent. If you’re a buyer, as soon as someone lists your requested item for equal or less than you’re offering, you get it for that price. There’s even a list of the last five sales to show both parties what the going rate is for an item (this is far more accurate for rare items than for common ones: if an item is selling in huge amounts, the last five merely displays a constantly shifting snapshot of current demand, and can easily skew the perceived value of an item by a single person paying too much for several of them). What I hadn’t understood about the consignment house until reading the market threads was the method the system used to match buyer and seller when there are a lot of bids and/or a lot of sellers. When something only has 1 buying or selling, it’s very easy to (barring listing fees for the seller) figure out through trial and error whether the seller is willing to sell for the price the buyer is willing to pay, even though the transaction is completely anonymous. Things get more complicated when things are selling briskly: you may have to bid 1,000 to immediately get something that has a thousand for sale and usually goes for 100. Meanwhile, you might be able to bid 20,000 for something currently selling for 100,000, and get one in a few minutes. From a seller’s perspective, you’ll sometimes list something for what appears to be the going rate, and fail to sell it for hours or days even though the sales are still turning over at roughly the rate you listed, sometimes lots more, and sometimes you’ll list something for a pittance and receive way more than you expected to get. I had assumed that there was something complicated going on with first in/first out based on time of listing being compared to amount offered. The common wisdom on the forums is that it’s much simpler than that: bids are sorted from highest bid to lowest, sales are sorted from lowest list price to highest, and the two are paired off until the highest bid no longer is enough to get the lowest list. If there are three people bidding 5,000, 4,500, and 4,000, the item listed at 1,000 will get 5,000, the item listed at 3,000 will get 4,500, and the item listed at 5,000 will get nothing (because the remaining 4,000 bid is insufficient, even though it would have matched perfectly to the original high bid). This goes a long way to explaining how there can be certain items that will have hundreds of the same item both listed and bidding: high bids don’t peel off the high list prices until all the cheaper items are sold. Meanwhile, theoretically you can list an item at 1 and get the maximum amount currently on offer (though you may have no real idea how much that is). I’m genuinely curious why the market was designed this way. If I’d set it up, as mentioned previously it probably would have had something to do with priority: earliest listed item goes to the first person to bid at least that amount. Another way to do it would be to try to match highest to highest: If there are items listed for 5,000, 4,000, and 3,000, a bid of 4,500 takes the 4,000, then a bid of 4,000 takes the 3,000, and, finally, someone will have to bid over 5,000 to take the 5,000. Either method would seem to make it less likely that the situations of lots for sale and lots bidding would happen, but I wonder if the current method doesn’t have advantages. My first thought would be that the load on the server/database is less severe by doing a simple sort of two tables and matching the top rows; anything even slightly more complex might add up over the presumably millions of transactions hitting the system each day. Another benefit is adding in a risk vs. reward scenario: a low-listed item might sell very quickly for the going rate, but just as easily might sell for a pittance if the demand suddenly drops. To sum up: City of Heroes has a very unusual player to player market system, and I’d be interested in seeing more games attempt a consignment system rather than an auction system, possibly with different rules for matching players to see what variations do to the overall model. 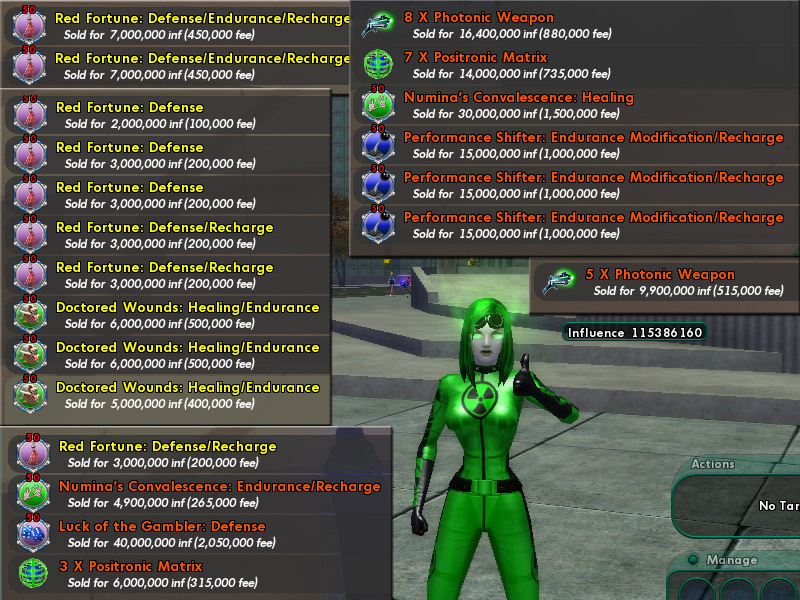 Right now on City of Heroes, generic crafted level 50 accuracy-improving enhancements are selling for 500k each in the game’s currency at the player auction house. This isn’t too bad, considering that level 40 versions of the same enhancement are selling for 400k. Except that level 40 enhancements cost 200-300k to craft (depending on how much you paid for the components), while level 50 enhancements cost 1 million to craft before you even add the components. Anyone off the street can make a tidy profit from crafting and selling the level 40s, while anyone trying to sell the higher level versions is going to bleed currency like a sieve. The problem comes from how crafting is regularly incentivized in MMOs. Back when I was playing World of Warcraft (and I have no reason to believe it’s any different now), the advice to players wanting to make money as quickly as possible was to take two gathering professions (instead of a gathering profession and a craft). The reason for this was very straightforward: for almost every crafted item at every level, the components of the item would sell for more on the auction house than the actual item. Nearly every crafted item was sold at a loss. The reason for this is very simple: the crafters weren’t making items for sale, they were making them for skillups. WoW’s crafting follows a very hierarchical progression; a crafter can’t make items appropriate for a higher level until increasing his or her skill by making many items of lower level. The vast majority of crafted items posted to the auction house were, therefore, priced mostly incidentally: their value to the crafter was that making them had increased his or her skill by a point, not what they’d sell for. Remember those people with two gathering professions? Once they reached the level cap and had plenty of money, they might decide that they wanted to dabble in the crafting system. They’d drop one of their gathering skills, start a new craft at 0, and then proceed to buy lots of components (driving up the price), craft recipes to skill up as quickly as possible, and sell the crafted items as an afterthought (glutting the market with cheap items and driving down the price). The cycle repeated itself. Why level a crafting skill at all? Each contained a few decent crafted items that were either usable only by the crafter, or were hard to get. Thus, amidst the dross of crafted goods, there were a few rare items that were worth more than their components, and worth all the trouble of skilling up crafting to get. City of Heroes’ situation is a bit more complicated, but similar. Instead of offering skillups, CoH offers crafting badges. Once you’ve made a certain number of enhancements of a given type and level, further enhancements of that kind don’t require a new recipe and the actual crafting is done at half-cost. For the Level 40 Accuracy enhancement mentioned above, that’s a saving of around 150k (3/8 of the sale price becomes pure profit). In order to sell enhancements at this profit, though, a crafter has to make a lot of enhancements at a minimal profit, or even a loss, first. And even when the crafter gets the badge that makes crafting the enhancement profitable, he or she is still competing with random-drop non-generic recipes that cost the same to make no matter who crafts them. The level 50 enhancements are so much less profitable largely because level 50 is the max level, and characters there would rather buy specific set-based enhancements than the generics. But, ultimately, the low price of crafted enhancements is the same problem as WoW. Accuracy enhancements are one of a few exceptions that are in high demand; most crafted enhancements sell for far less than the cost of their components, much less the cost of crafting. I spent the last week as part of the problem: I was trying to get all the crafting badges* on one of my characters, so the actual enhancements were just the trash left over from getting the badge. Anyone on when I was could have gotten enhancements that cost up to 200,000 to craft for as little as 100. And I still had to delete a lot of the lowest level ones because the market was so glutted that it wasn’t worth tying up an auction slot for days on something I was basically giving away. This long and rambling explanation brings me to my point: MMOs will never actually be virtual worlds for the purposes of crafters as long as learning to craft is part of the grind. In the real world, crafted goods very rarely cost less than the materials used to make them. There are simply too few people making any given thing relative to the population as a whole, and even fewer of them that can afford to take a loss on their work. But in an MMO, fully everyone in the population can be a crafter; and as long as a number goes up on the character sheet and something useful eventually comes out, very few are going to actually care that crafting is an expense rather than an income. The game is to make the crafting skill number go up, not to make money with the crafting. But I think there is a significant minority of players that go into these games with the fantasy of becoming a crafter in the traditional sense: buying components wisely, putting hard work and love into a creation, and selling it for a profit. For these people, requiring them to make 10 of Widget A and 10 of Widget B before they can make Widget C (the one they really want to make) is not a feature. Requiring them to go gather their own materials if they want to actually make a profit on their crafting (and still knowing they’d have made more of a profit just selling the components) is not a feature. And you’d likely have enough of these people that your economy would be perfectly healthy if they were only competing against one another on price, instead of against the unrealistic prices set by high-level characters grinding up a tradeskill. The rest of your players probably wouldn’t care, as long as they still had things to do that interested them. For this to happen, it requires designing part of the game around players that have little interest (or even capability) in beating up walking sacks of EXP and leaving one more number that goes ding off of the majority’s character sheets. It’s a lot harder than just letting everyone craft, forcing them to grind it up, and thereby adding an additional time sink to the game. But it might result in a much healthier economy and much happier crafters.